Evaluation shows the effectiveness of teaching and learning of a class. Mostly teachers provide evaluation in low cognitive level so students are able to achieve the minimum passing grade. Whereas a good evaluation should use Bloom’s Taxonomy as a basis for classifying student’s cognitive level. It leads teacher to provide a learning that facilitates student’s achievement of high cognitive level, including using independent lab work module. Teachers also typically provide a global report evaluation, i.e. providing the final score only, without presenting the distribution of students’ cognitive level. For this purpose, Venn Diagram is used to show the distribution of students’ cognitive level based on Bloom Taxonomy. This research aimed to present the distribution of students’ Bloom cognitive level using Venn Diagram and to investigate whether the development of independent lab work module about light refraction using PhET simulation “Bending Light“ can make students achieve the cognitive levels of knowing, understanding, applying, and analyzing. The obtained data was analyzed using qualitative descriptive method. The respondents were 17 freshmen of Physics Education and Physics Students of UKSW Batch 2016. The post-test showed that all students achieved higher cognitive levels. Thus, the developed independent lab work module was able to improve students’ cognitive level. Venn Diagram could also simplify the presentation of the distribution of students’ Bloom cognitive level for teachers. Agustihana, S. (2015). Analisis peningkatam higher order thinking skill siswa Kelas XI SMAN 15 Surabaya dengan model pengajaran langsung dan kooperatif pada materi dinamika rotasi. Jurnal Inovasi Pendidikan Fisika, 4(2), 124–128. Astuti, M. P., Pattiserlihun, A., & Sudjito, D. N. (2016). Penggunaan diagram venn untuk analisa level kognitif mahasiswa berdasarkan taksonomi bloom pada conceptual learning tentang fluida dinamis. Prosiding Seminar Nasional Quantum (pp. 398–391). Yogyakarta: Program Studi Pendidikan Fisika, Universitas Ahmad Dahlan. Azar, A. (2005). Analysis of turkish high-school physics-examination questions and university entrance exams questions according to blooms’ taxonomy. 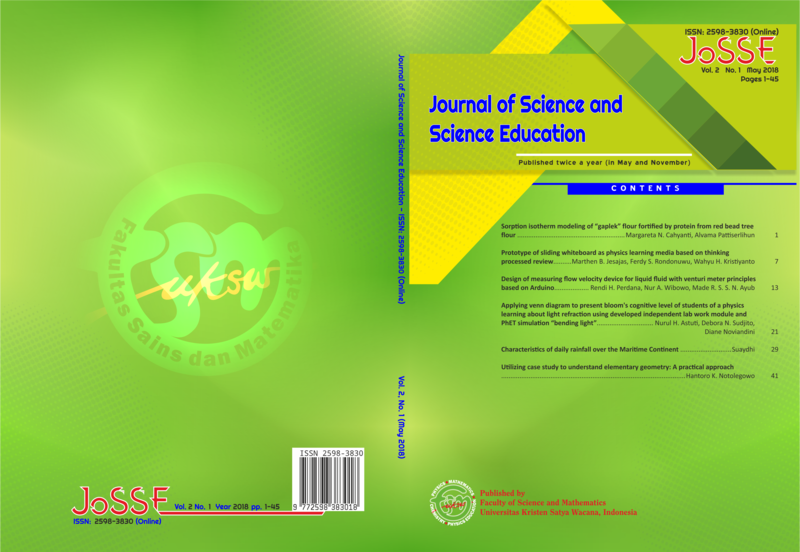 Journal of Turkish Science Education, 2(2), 144–150. Dinavalentine, M., Noviandini, D., & Sudjito, D. N. (2017). Desain modul praktikum mandiri tentang pembiasan cahaya menggunakan simulasi PhET bending light untuk mahasiswa (Unpublished graduate final assignment). Universitas Kristen Satya Wacana. Maghfiroh, Q., Tapilouw, M., & Herrhyanto, N. (2013). Penerapan model pembelajaran konseptual interaktif (interactive conceptual instruction) untuk meningkatkan kemampuan pemahaman konsep matematis siswa SMP (penelitian eksperimen terhadap siswa kelas VII di SMP Negeri 29 Bandung). Jurnal Online Pendidikan Matematika Kontemporer, 1(1). Perkins, K., Adams, W., Dubson, M., Finkelstein, N., Reid, S., & Wieman, C. (2006). PhET: Interactive Simulation for Teaching and Learning Physics. The Physics Teacher, 44, 18–23. Pirooznia, M., Nagarajan, V., & Deng, Y. (2007). GeneVenn - A web application for camparing gene list using venn diagram. Bioinformation, 1(10), 420–422. Rosmalinda, D., Rusdi, M., & Hariyadi, B. (2013). Pengembangan modul praktikum kimia SMA berbasis PBL (Problem Based Learning). Edu-Sains, 2(2), 1–7. Sutiadi, A., & Kurniawati, R. (2015). Analisis butir soal ujian nasional SMA bidang fisika menggunakan taxonomy of introductory physics problem. Universitas Pendidikan Indonesia. Prosiding Pertemuan Ilmiah XXIX HFI Jateng & DIY (pp. 306–309). Yogyakarta: HFI Jateng & DIY. Wijaya, M. S. (2017). Pengaruh praktikum virtual terhadap keterampilan berpikir kreatif siswa kelas X pada materi vertebrata (Unpublished graduate final assignment). Fakultas Tarbiyah Dan Keguruan, Institut Agama Islam Negeri Raden Intan Lampung.